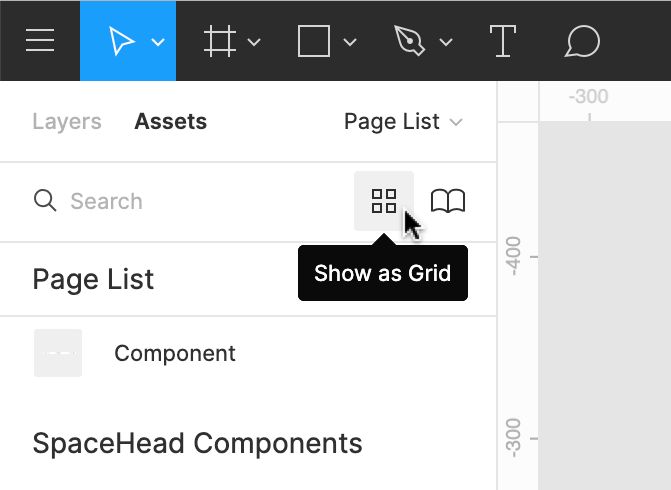 The sidebar on the Right allows you to view and adjust the Properties of any object. You can also access the File's Prototype settings and view the Code of any selected object(s). We refer to this as the Properties Panel. You can learn more about this in our Properties Panel article. 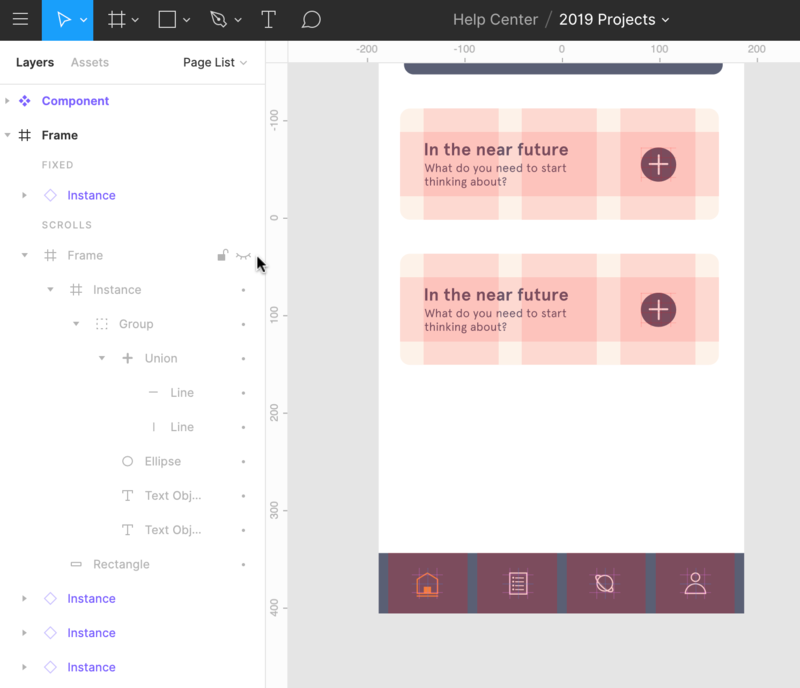 The sidebar on the Left gives you access to the Layers, Assets and Pages included in your File. 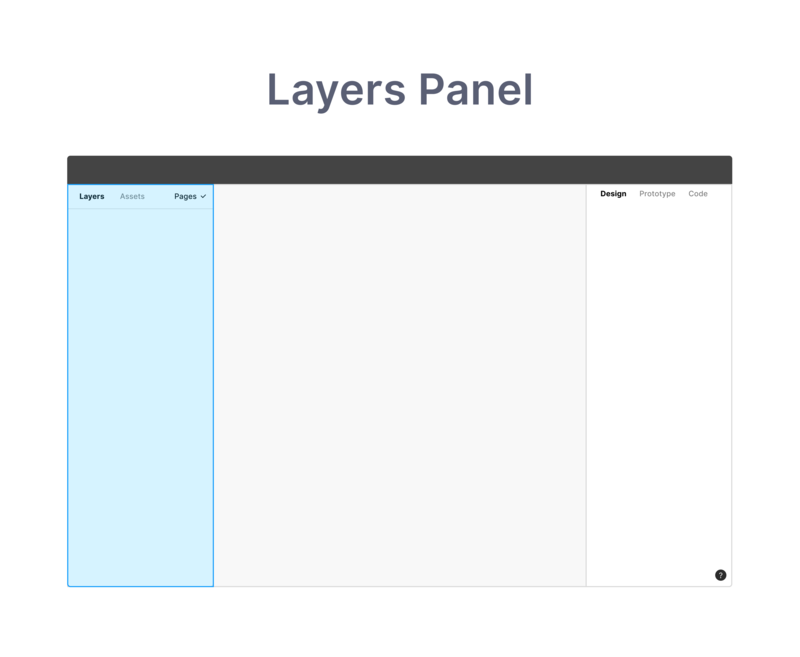 We call this the Layers Panel. 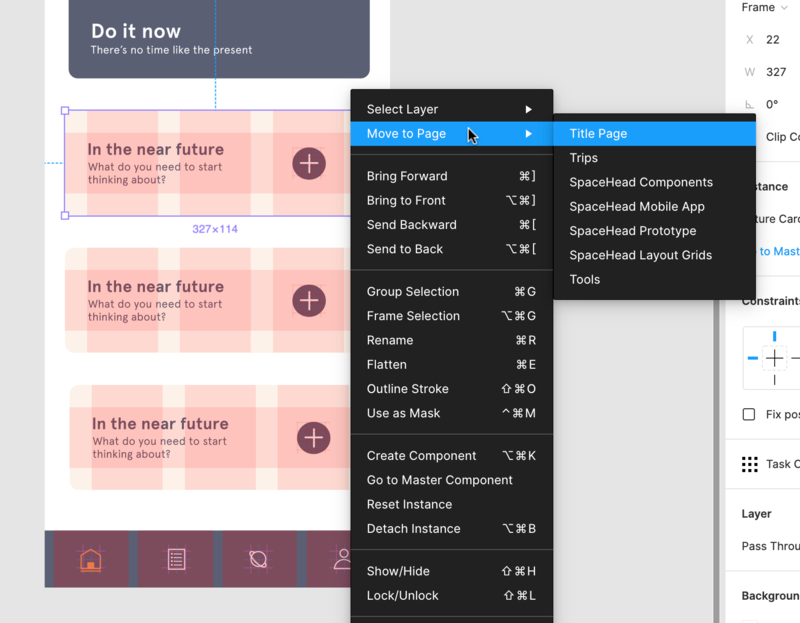 In this article, we're going to get you up to speed using the Layers Panel. 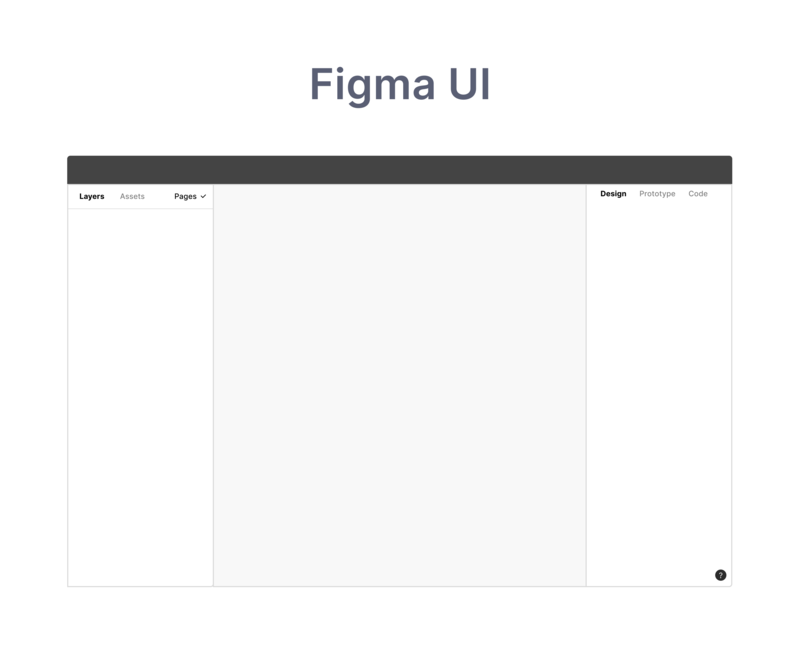 This allows you to view your designs in the canvas, without the Figma UI. 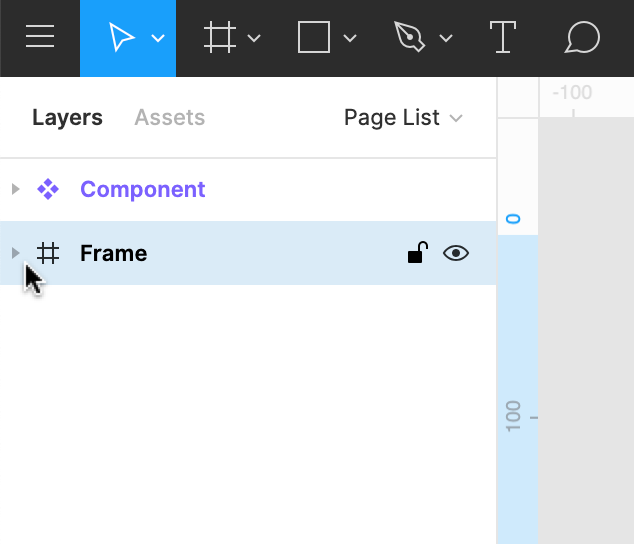 Any Frames, Groups or Objects you add to the canvas will be visible in the Layers Panel. New Layers will be added to the top of the list, or the top of the Group or Frame it is within. 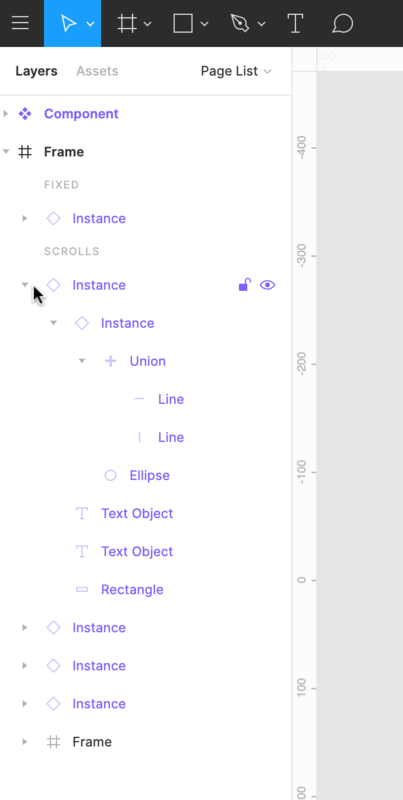 Hover your cursor over the right-edge of the sidebar. A bidirectional arrow will appear. Click and drag to adjust the width of the panel. 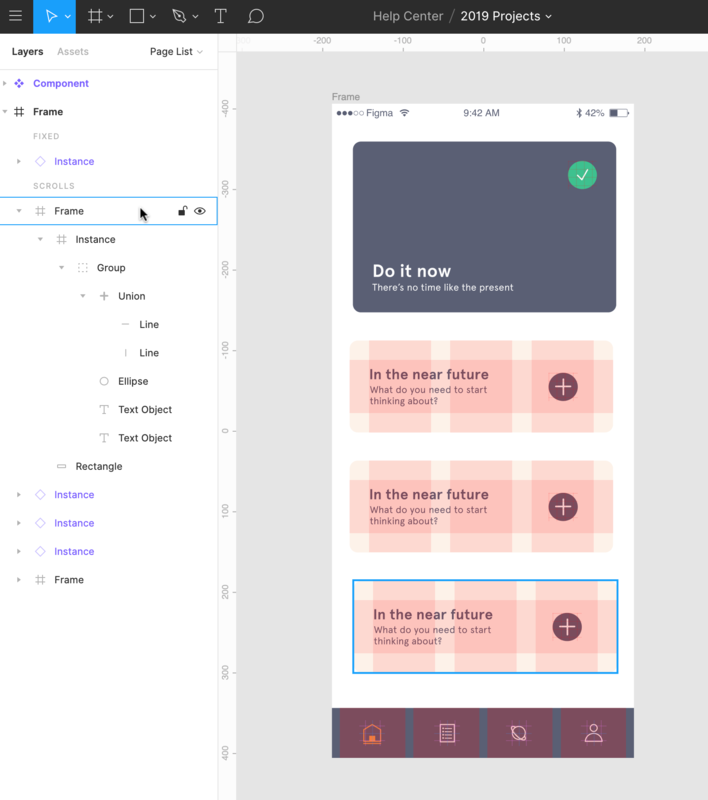 Release to set the sidebar width. You can click on a Layer in the Layers Panel to select it. A selected Layer will show up as blue in the Layers Panel. We will also show a blue bounding box around the Later in the canvas. 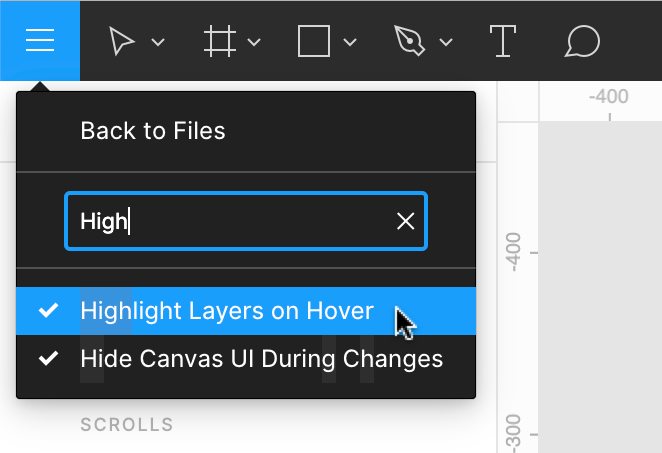 You can also highlight a Layer in the canvas by hovering over the Layer in the Layers Panel. 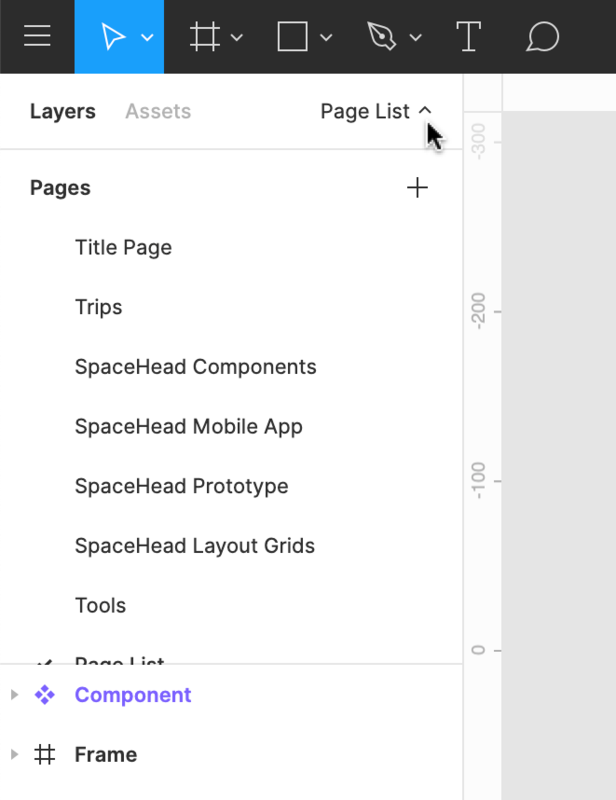 You can change the order that Layers appear in the Layer Panel. This allows you to move specific Layers to the front or back of the canvas, as well as move Layers in or out of a Group or Frame. Adjusting a Layer in the Layers panel won't affect its position on the canvas. It may change how you can see, select or Group the Layer in the canvas. Select the Layer(s) in the canvas. 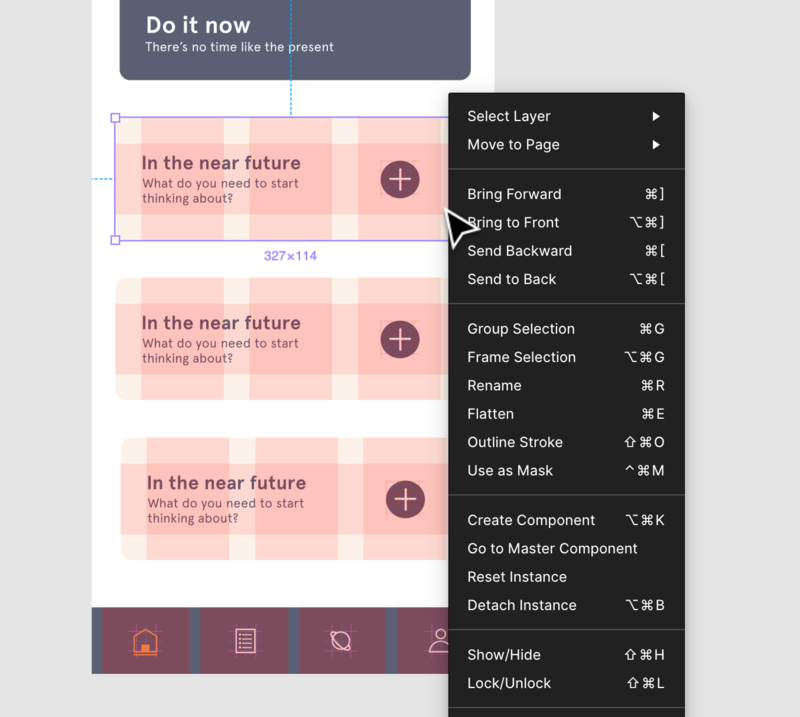 Click and drag the Layer to change its position in the hierarchy. Moving the Layer towards the top of the list will bring the Layer to the front of the canvas. Moving the Layer further down the list will push the Layer behind those layers in the canvas. 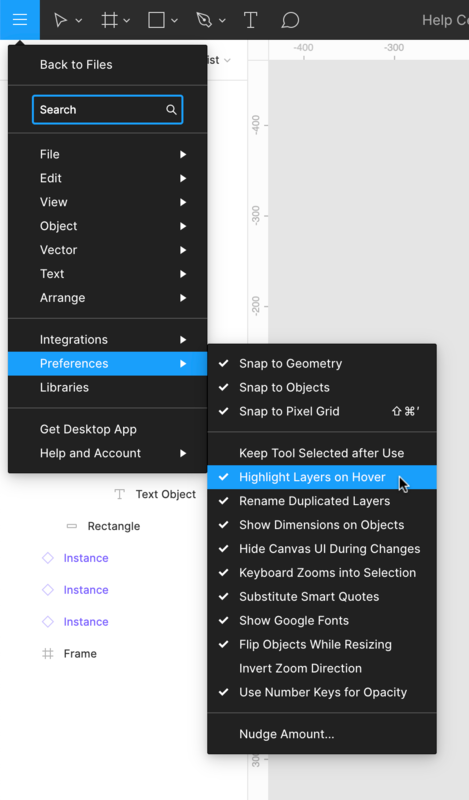 You can toggle a Layer's visibility in the Layers Panel. You can still change the position, or adjust the properties of a hidden layer. The Layer will no longer be visible in the canvas. 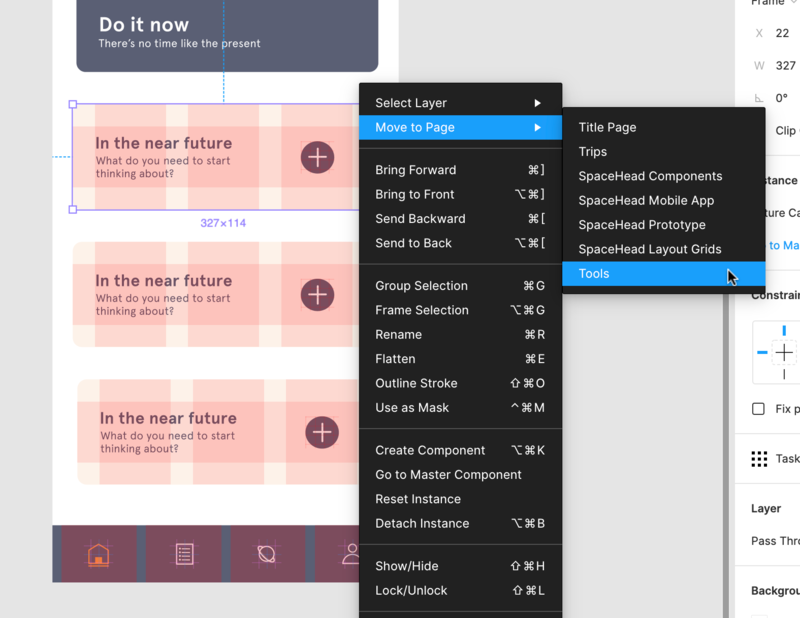 It will also appear as inactive in the Layers Panel. You can lock Layers to protect them from accidental edits. When you lock a Layer, you will not be able to interact with it, or move it around in the canvas. It's still possible to change the Properties of a locked layer in the Properties Panel. If you lock a Frame or Group, then any child Layers of that Frame or Group will also be locked. You will have the option to unlock any child Layers individually. You will no longer be able to edit the Layer in the canvas. Tip! 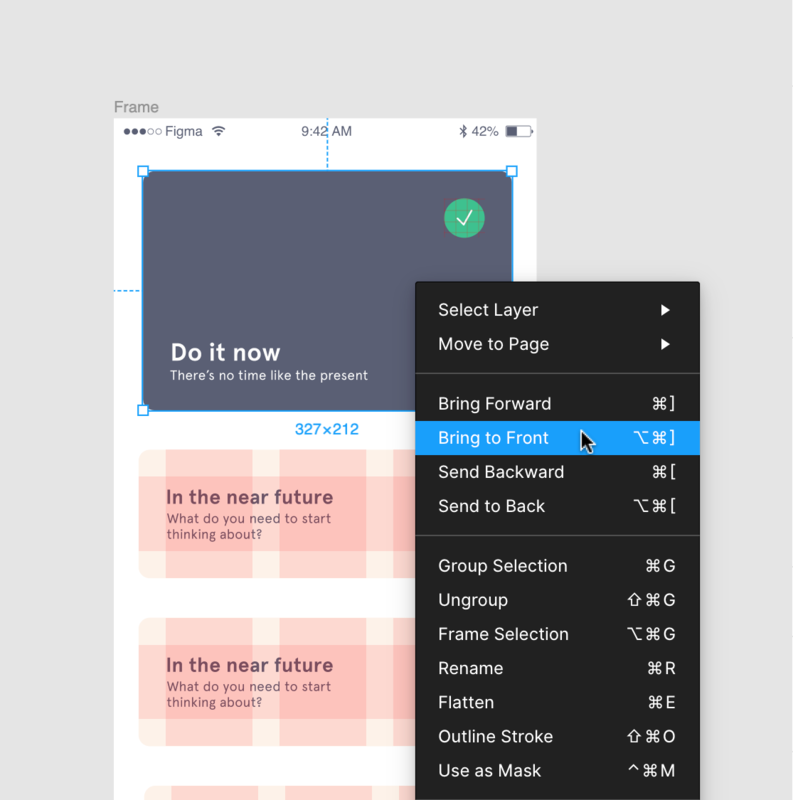 You can toggle Layer Visibility and Locking for multiple Layers at once. 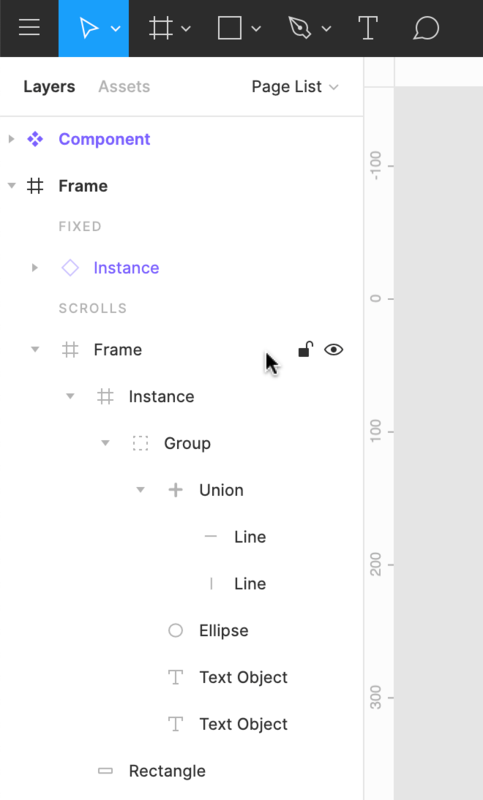 Click on the eye/padlock icon and drag across the Layers you want to update. There are often aspects of your design that you can reuse. This could be a button or an icon, or more complex UI elements like navigation menus or status bars. 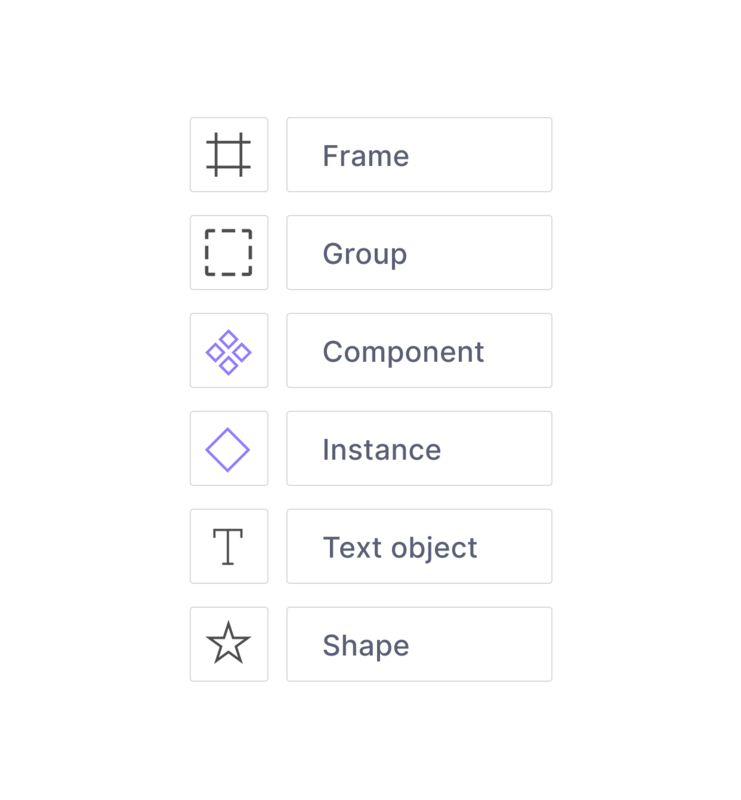 You can create Components of these elements, which you can reuse across your designs. Any changes you make to a Master Component will be available to any related Instances. This brings together Components from the current File, and any Files or Libraries you have access to. This looks for Components in the current File, as well as any Libraries you have access to. 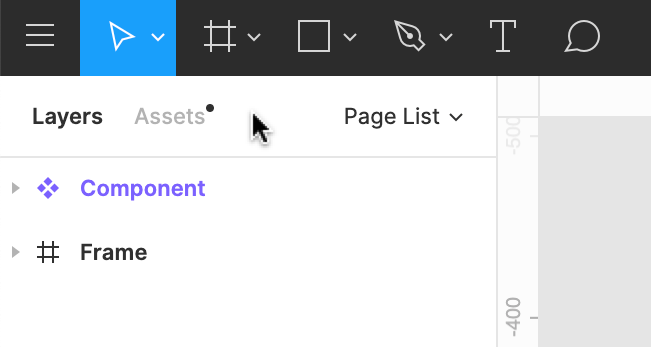 You can then drag Components from the Assets Panel, on to the canvas. Components you have created in the current File. Components that are Private to the File. This includes any Components in this File that aren't published to a Team Library. Components from other Files that you have used in the current File. Components from any enabled Team Libraries. 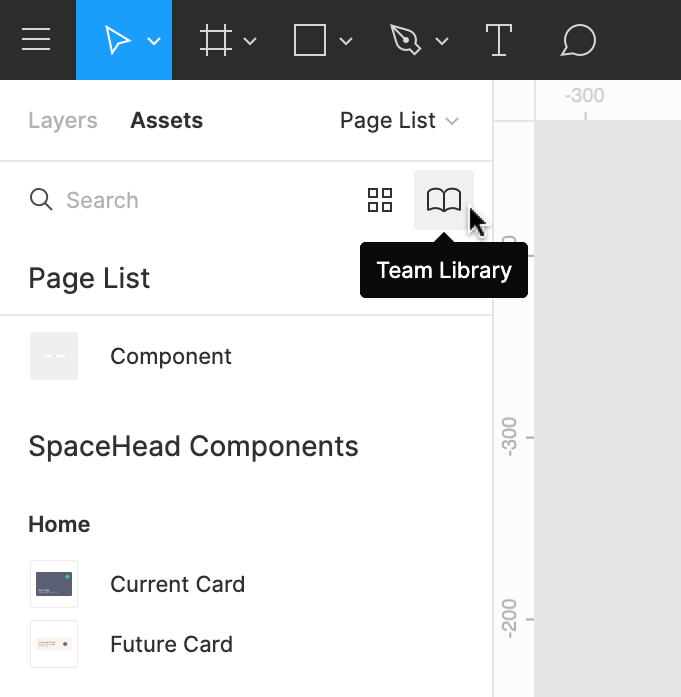 The Team Library allows you to publish Components from your Files to your Library. You can then create Instances of your Components and use these in other Files. Learn more about the Team Library in our Using the Team Library article. Pages allow you to create separate canvases within a single File. There is no limit to how many Pages you can add to your File. If you're expanding beyond the original purpose of your File - or your File is getting large - you may want to consider a new File instead. 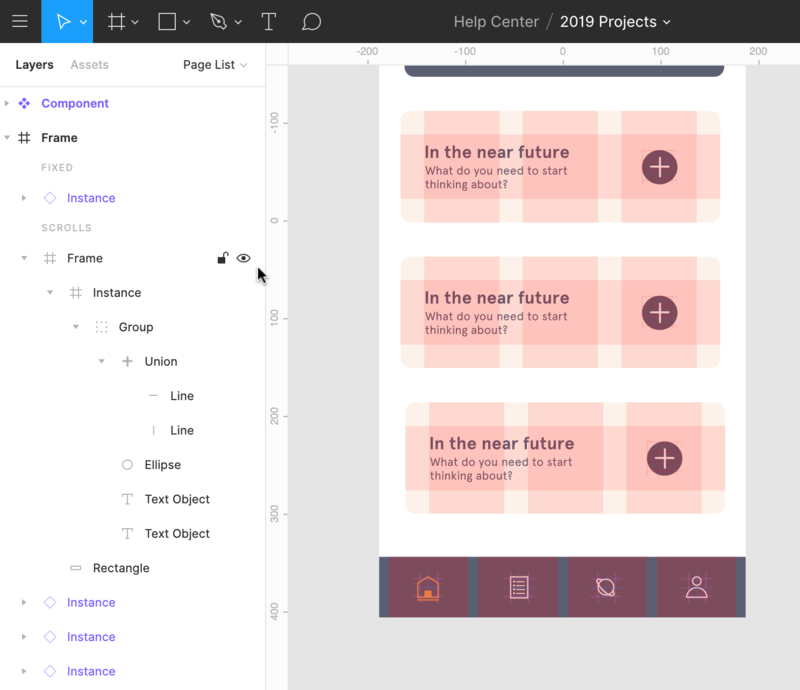 Creating different Prototypes of your designs. Tip! 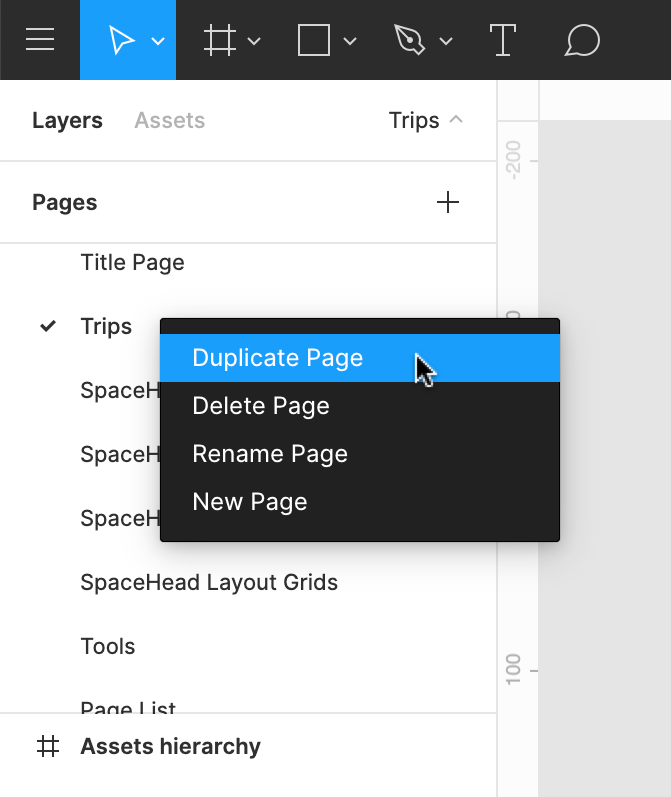 You can create more than one Prototype within a File by creating them on separate Pages. Learn more about creating Prototypes in our Getting Started with Prototyping article. 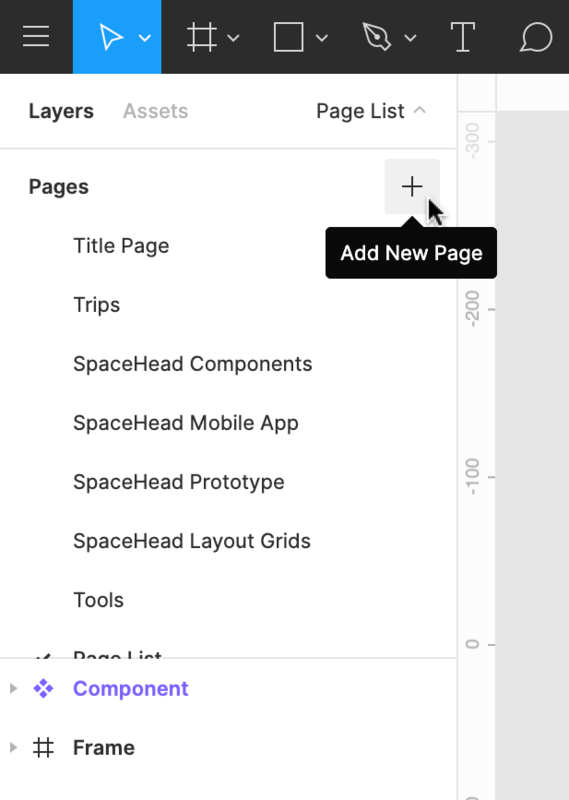 You can find the name of the current Page at the top of the Layer's Panel. 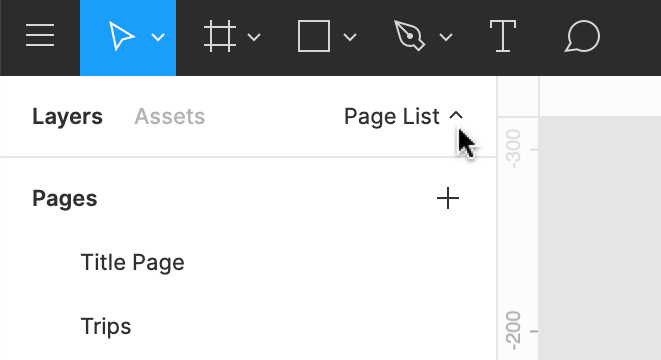 This will open the Layers Panel where you can view a list of Pages in that File. 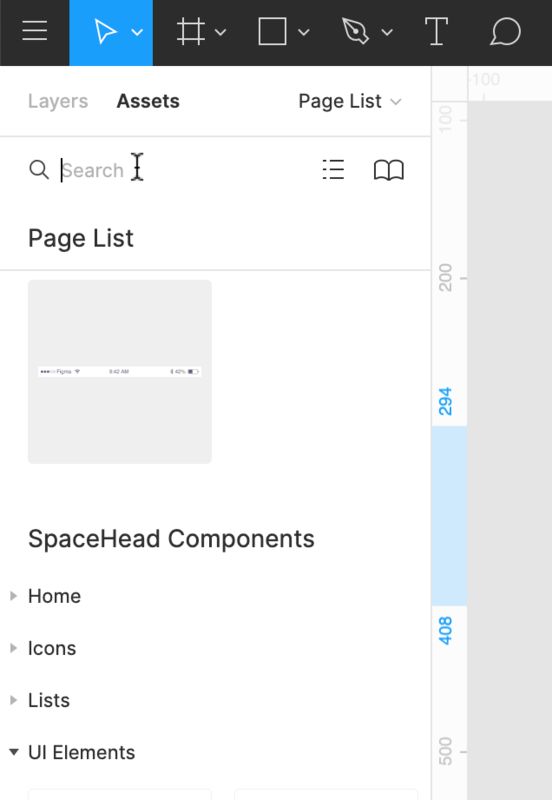 You can move Layers between Pages. This is handy when you want to break up a large File. This also allows you to keep any Comments associated with those Layers intact. Select an Object, Frame or Group in the canvas or Layers Panel. 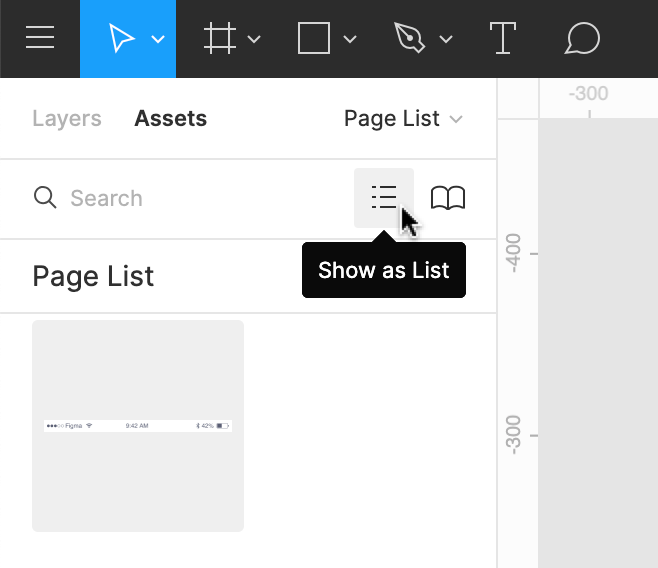 The Object, Frame or Group will move to the same coordinates on the new Page. Objects are individual elements that you add to the canvas. These can be Shapes, Vector Networks, Text objects or an Image. Groups are collections of objects. They allow you to move and position objects as if they were a single layer. A Group takes on the combined dimensions of the Objects contained within them. Groups don't have any properties of their own. Any Properties you apply to a Group, will apply to the individual objects instead. Like Groups, Frames are also collections of Objects. But Frames function more like Artboards, than Groups. They allow you to control the position, alignment and constraints of an Object. You can nest Frames within other Frames. Learn more about when to use Groups or Frames in our Groups and Frames article. Child and Parent are terms that are usually used in web development. We use these terms to explain the relationship between a Frame (parent) and any Objects within it (children). A child's Constraints and alignment will always be in relation to its parent. 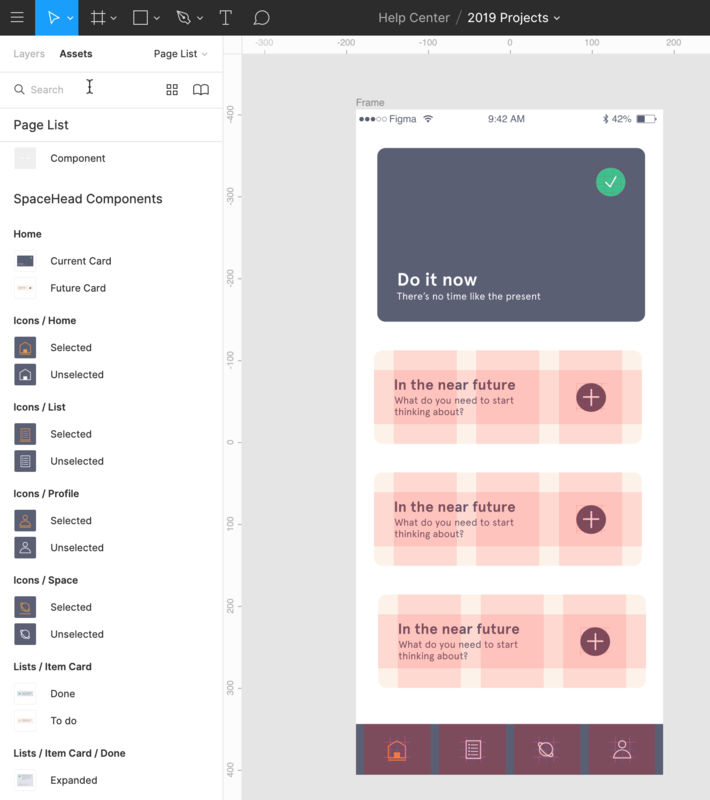 Components are UI elements that you can reuse across your designs. 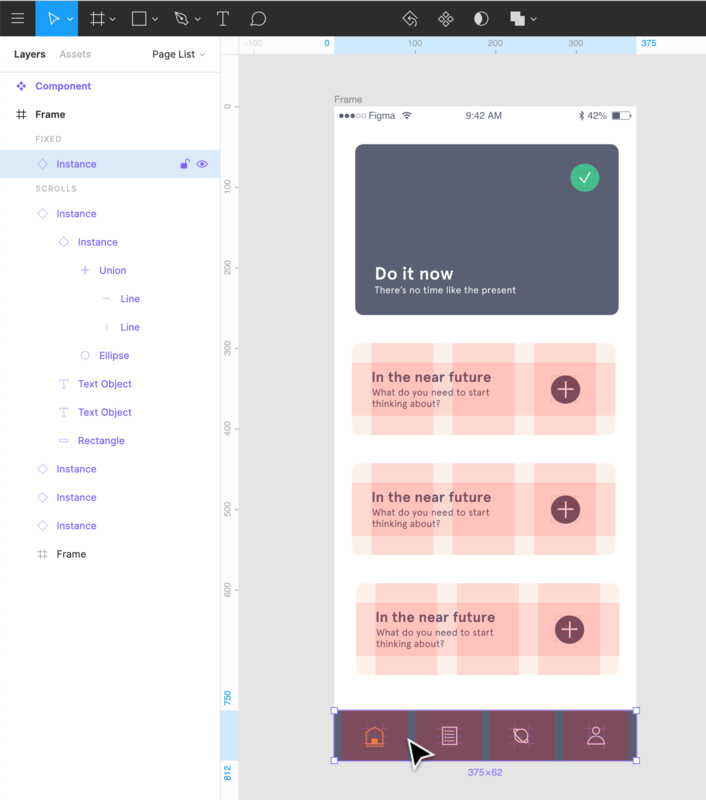 This could be a button, navigation menu, gallery, or layout. To reuse a Component you can create an Instance. 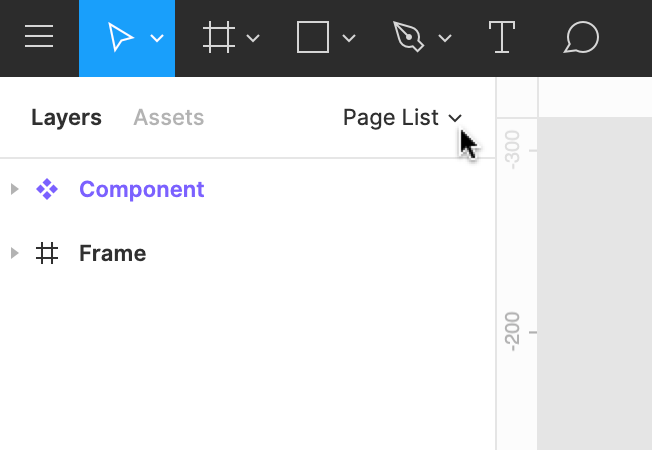 Learn more about Components.